It goes without saying that you need to do a lot of planning for a road trip, especially if access s a concern. That said, sometimes things don’t go as planned and you just have deal with it. Usually it requires thinking on your feet, but on the plus side, sometimes detours can reveal some cool sights that you wouldn’t have found on your original route. Such was the case yesterday, when we had to deviate from our route from Utah to Colorado. Originally we had planned to go through Wyoming and see a property on the border, and then drop back into Colorado and spend the night at an accessible yurt. Unfortunately our site visit in Wyoming was cancelled, so I just figured it was best to head straight through Utah on Highway 40, since our yurt was located close to it. The good news was that the new route cut don on our driving time considerably, so I started looking at the map to see what we could do along the way. And all of a sudden it popped out at me – Dinosaur National Monument. To be fair, this monument spans two states. The Utah side boasts dinosaur bones in situ, while the Colorado side has some gorgeous canyon views. Since we only had a few extra hour we opted for the Colorado side – and we weren’t disappointed. We started out visit at the Dinosaur National Monument Visitors Center, just east of Dinosaur, Colorado. There was plenty of accessible parking there, with barrier free access to the Visitors Center. Inside we watched a 12 minute move, which really gave us the lay of the land. Then after having a nice picnic lunch at the wonderfully shady accessible picnic tables, we headed on our way to do the scenic drive to the top of the canyon. 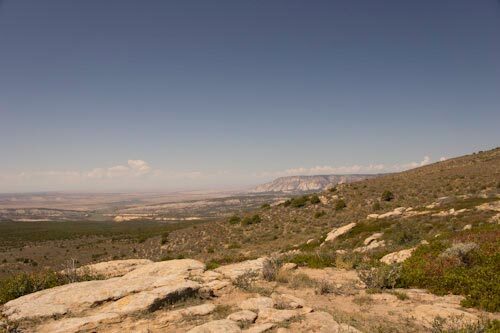 Our first stop was the Escalante Overlook, where we got a view of Grand Staircase – Escalente National Monument. We’ve visited the park before and even driven down the Burr Trail, but you really get the best view of this natural wonder from afar. The overlook was deserted, and even if you didn’t want to get our of your car, you could still get a great windshield view. The drive up to the Canyon Overlook was equally scenic, and the view from the top was stellar. We went all the way to the top overlook at first, but then found a lower overlook on the way back, which was equally impressive. The lower overlook is also a great place to picnic, as there is one accessible picnic table with a great view of the canyon. And if was kind of fun to see the same canyon that we saw in Canyonlands National Park – only from a different perspective. All in all it was a fun detour. And since there was no admission charge it was easy on the wallet too. So next time you are tooling through Western Colorado on Highway 40, be sure to stop at Dinosaur National Monument. You won’t be disappointed!! 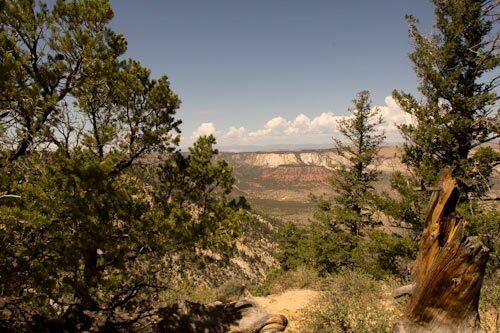 This entry was posted in Recreation, Road Trips and tagged barrier-free, Colorado, Dinosaur National Monument, driving trips, Escalante, National Parks, wheelchair travel, wheelchair-access by Candy B. Harrington. Bookmark the permalink.